Ask any angler the best place to fish and most will tell you about a hidden gem right in their own backyard. WFN: World Fishing Network, North America's only 24-hour fishing lifestyle network, is asking anglers in the U.S. and Canada to select WFN's Ultimate Fishing Town 2012. The network is once again running separate contests in Canada and the United States, with the town in each country tallying the most votes earning national recognition as WFN's Ultimate Fishing Town, a $25,000 community donation and more. Beginning on April 2, WFN began accepting nominations at www.wfnfishingtown.com from anglers across the U.S. and Canada who believe that their town is WFN's Ultimate Fishing Town. In addition to the national recognition, the winning town will receive a $25,000 community donation to be used towards fishing-related cause(s), plus a tourism boost as WFN produces a feature about fishing in their town and airs it on the network and WFN website throughout the year. "No matter if they love to fish in a small rural community or a popular tourist destination, we encourage everyone to nominate their town," said Mark Rubinstein President and CEO of WFN. "The search for WFN's Ultimate Fishing Town offers towns all across Canada and the U.S. a great opportunity to show the world why their town is the best place to fish. We look forward to sharing their stories and letting the people choose WFN's Ultimate Fishing Towns for 2012." Last year, Chapleau, ON, and the tiny hamlet of Roscoe, NY, located two hours north of New York City, were selected as WFN's Ultimate Fishing Town Canada and U.S. respectively. In all, more than 500 towns across the U.S and Canada were nominated and nearly one million votes were cast. In 2010, WFN ran its inaugural search for Canada's Ultimate Fishing Town, and Port Alberni, B.C., was the winner. "I encourage all of the great fishing destinations all across the U.S. and Canada to enter this contest," said Elaine Fettig of The Roscoe - Rockland Chamber of Commerce, the group who spearheaded the town's efforts last year. "This experience brought our community and the surrounding areas together -- from folks spreading the word about the contest; to the media speaking about it frequently; to business owners allowing staff to vote during the business day. The opportunities this award has provided to Roscoe in the past year have been remarkable." "Chapleau has been hard hit by the downturn in the forestry industry and is working to rebuild itself through economic diversification," said Charlie Plourde of the Chapleau Fishing Advisory Committee. "Being named WFN's Ultimate Fishing Town put Chapleau on the map as a fishing destination for anglers around the world and has created an opportunity for our tourism industry to thrive." People can nominate their town from April 2-30, 2012 by visiting www.wfnfishingtown.com. The website is designed so U.S. and Canadian visitors are automatically directed to the appropriate contest. 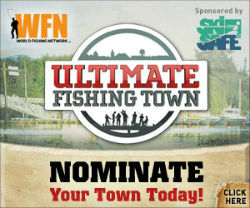 Nominations may include photos, videos and testimonials about why the town should be WFN's Ultimate Fishing Town 2012. If a town is already nominated, people are encouraged to add additional comments, photos, videos and more. Following the nomination period, the public voting will be open from May 1-31, 2012.